A man was killed and a woman was listed in critical condition after a horrendous crash near Conroe, Texas. According to a KHOU news report, a child between the ages of 3 and 4 was ejected from the vehicle as it crash and was found wandering around, officials said. Authorities say the fatal crash occurred during the early morning hours of March 4, 2013 on Old Houston Road near Stevenson Drive in Montgomery County. Emergency personnel found a vehicle upside down in a ditch. A female passenger was thrown from the car and was lying unconscious nearby. She was hospitalized in critical condition. 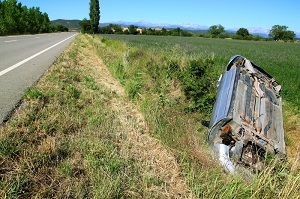 A man was trapped in the car and later died at the scene. The toddler who somehow escaped serious injury was taken care of by a nearby resident until rescue crews arrived on scene. He was sent to the hospital for an assessment, but only seemed to have suffered scrapes and bruises. At this point, officials believe that only one vehicle was involved. The vehicle hit a culvert pipe on the side of the street at a high rate of speed and flipped, causing the sedan to disintegrate, officials said. The investigation is still ongoing. What Caused This Tragic Crash? Based on this news report, it is unclear as to how or why this tragic collision occurred. There are several unanswered questions here. How fast was the driver of the sedan going at the time of the crash? Was there a vehicle defect or mechanical malfunction in the vehicle, which may have caused it to go out of control? Were alcohol or drugs involved? What was the relationship between the people in the vehicle? A Daily Mail article states that the adult occupants of the vehicle were the parents of the toddler. I trust officials are still trying to piece together the evidence and other information in order to determine precisely what occurred here and why. In such cases, it is important that the vehicle is preserved in its crashed condition, unaltered, so an expert and thoroughly analyze it for defects, malfunctions and other evidence. Victims or families of deceased victims would also be well advised to contact an experienced car accident attorney who will stay on top of the official investigation and ensure that their legal rights and best interests are protected.